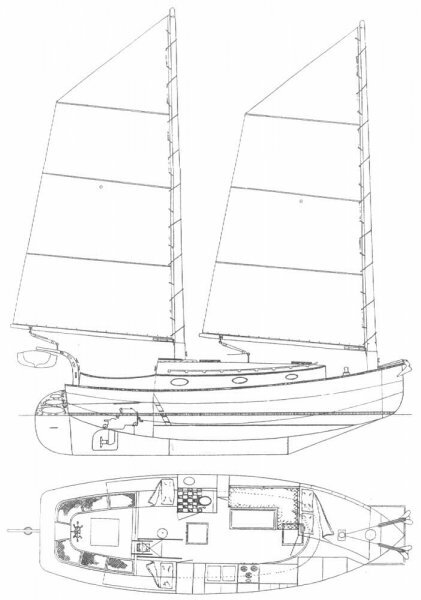 Designed as a cat schooner; both sails have big round poles at their leading edges. Considering the performance potential of this hull, this rig is appropriate. The stayless rig is clean and will be cheap to build with solid fir poles. The plans call for these masts to be deck stepped, but that's a tough way to support unstayed masts. The layout is simple and comfy for a couple with two guests.There's plenty of available cabin sole in this layout. This design is targeted for safe performance in heavy weather.